Happy Memorial Day! And lest you think I'm getting in a rut with Mish-Mash Monday, note that today it's Mish-Mash Memorial Monday. Ha! Well, let's get to it. I just love Esther's Monday Maths, and I've been inspired to do a second one myself. I didn't write a poem, but hopefully that's offset by the fact that I actually drew something. Esther told me, and I quote, "Not being able to draw is never a reason for not drawing!" So there you go! Crayon is definitely my medium. As Monday Maths tries to convey, I'm very grateful for all the great people I've met through gardening, both in real life and online. You guys are the best! Gardeners love to share and I'm so thankful for all the plants I've gotten from local friends over the years, and recently from my blogging friends! As mentioned in another post, Shady Gardener sent me some Virginia bluebells. But it's not just plants, but camaraderie we gardeners share. I got to know two of my closest friends IRL through the master gardener program and I've enjoyed getting to know so many of you online. I love getting and leaving comments and I enjoyed meeting a few of you already, and I'm looking forward to meeting more of you at SF. I truly consider you friends, who pick me up and share their lives, gardening and otherwise. Last week, I got two packages in the mail, one from Gail in TN and one from Randy in AL. Here are the contents of both packages, waiting to be planted. Gail sent Phlox pilosa (also known as PPPP), Penstemon X, and Iris cristata. Randy sent two very cute baby shrubs: a nandina which I had oohed and aahed over in his blog and a sweet mock orange (Philadelphus coronarius), plus Crocosmia 'Firefly' and a bunch of bearded iris rhizomes, including 'Beverly Sills,' my first ever named iris. I know! Here is PPPP close-up, with Penstemon X in the background. 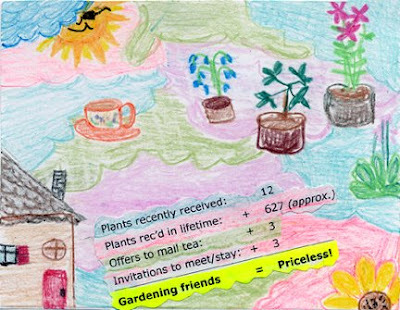 I hope my Monday Maths drawing is good enough for Gail to pick out her PPPP and for Randy to find his nandina! And thanks so much to both of you for sharing your plants with me! I also got three offers from my English garden friends to mail me tea, based on another post, which was so nice and unexpected! Thanks so much in advance! I still have a lot more plants thinking of blooming than I have actual blooms. ...as does this red hot poker. I love how its buds and foliage look together--sort of like a yucca, even! I even love its curving stem, stretching up behind some evergreen shrubs for the light. On May 21, my first iris was getting ready to open. I love how the yellow beard peeks out here. Today two other irises are open, both this pale yellow color, but most of my irises still have buds. A few centaurea have popped up here and there in the garden. I love how they inserted themselves in the middle of these rudbeckia. I have five little clumps of pinks, three of which are blooming. I got these free, along with some sedum, as they were left over after I helped plant a green roof in downtown Ann Arbor last May. I even went back last November to get some snow photos of the green roof, but I have yet to post about this! This amsonia is a really cool shade of very pale blue. I keep meaning to move this allium but forget where it is in fall. I love the way it's hiding in the viburnum foliage (note Burny also has flower buds!). Here is a red twig dogwood flower cluster up close. Awwwww! Some Anemone are still blooming, but a few are done. I love how their seedheads look. I never realized they turned oblong, like coneflowers do. I love how this squirrel is just standing here, like that's the most normal position for a squirrel, ever. And she posed for me here, too, though my macro feature wanted to focus on the tree bark. And can you find the American toad in this photo? I knew you could! I love the silhouette of an ant (not The Iron Ant, incidentally) on the peony bud. Finally, Fiona says that if you missed James' birthday post yesterday, please stop by to wish him belated greetings. She also wants to assure you that while she is no longer a stray, she can still fend for herself and can unilaterally be considered wild. (IMHO, she's a sweet housecat, but no one asked me!) And in case you're wondering, and even if you're not, Fiona's nicknames will be covered on her birthday, July 4. Wow, what a post! Really great Monica! I enjoyed it tremendously! You covered the spectrum...and more;-) I really need to do a MMM post myself...but today I'm not sure if I have time; perhaps a MMT will do?? Have a wonderful Memorial Day in relaxation and remembrance;-) PS I am really wondering how people send all of these plants through the mail without having them wilt!? Does Fiona ferociously attack your ankles when you walk by her hiding spot by any chance? You're going to love PPPP and Penstemon X! They should be in every garden. The picture of the squirrel is hilarious. He looks like he's ready for a fight. Your Fiona is precious -- reminds me a lot of our Prissy. Die Flockenblume (centaurea) hat mir als Kind schon immer sehr gut gefallen. Muss ich jetzt auch unbedingt auf die Wunschliste setzen. Der red twig dogwood gefaellt mir auch gut - er steht bei mir im Vordergarten. Erst gestern ist mir aufgefallen, wieviel er jetzt im Fruehling gewachsen ist. Auch ich habe ihn relativ klein gekauft. Your picture is wonderful and colourful and cheerful - and to the point. I'm glad you enjoyed doing it too! Gardeners just are the best folks! Your plants arrived beautifully and I know you'll have lots of enjoyment from them. I bet you are getting very excited for SF so close. I wish you all lots of fun!! A Squirrel! What a nice visitor, Monica. Bei uns heißen sie "Eichhörnchen". Ich mag sie sehr. Fiona mag ich auch. Du hast süße Katzen und Du liebst sie sicher sehr. Schön blüht es in Deinem Garten. Die Iris gefallen mir außerordentlich gut. The Mish Mash Monday posts are always entertaining Monica. But this week you had me smiling the entire time. :) You are so right, crayon is definitely your medium. You are a better artist than me that's the truth. Great plants that Randy & Gail shared with you! They are so generous & I wish you the best of luck with them. Monica, Thanks for the wonderful MMM Post. I laughed out loud at the one of the squirrel. He/she looks so content just sitting there waiting for you to snap a picture. The plants are beautiful as usual. Do you know if the "Jack in the Pulpit" will survive in south Alabama? Hi Monica, wonderful mish mash and math, so that could be MMMMM! Yummy and/or noogie! I thought your art was wonderful too. Fiona is such a beauty, I look forward to hearing her names. What a sassy squirrel! I love the drawing, Monica and the way you have collaged the text over it! I so agree about gardening friends - there is a wonderful camaraderie. I remember when I had my first garden years ago, friends kept turning up with crates of cuttings and divisions and I was able to plant up the whole garden from virtually nothing!! I still treasure these plants and their descendants, which I've taken with me through several moves and they remind me of the friends who gave them. Happy Memorial Day (belated), Monica! I agree blogging friends are the best--what great gifts you've received! Looking forward to seeing PPPP in your Michigan garden. But most of all, I'm really looking forward to this weekend and getting to meet you in person! BTW, who's going to look after James and Fiona while you're gone?? Hi Monica, you have way more blooming than we do here. I've only ever shipped dormant plants, so I was quite amazed how well the plants looked when they arrived. I did cut off the blooms, which were drooping and didn't perk back up, so the energy can go into the roots. There's always next year for blooms. I've planted PPPP and penstemon X; their foliage looks happy and perky. My friends will water them while I'm gone. Looking forward to meeting you, too! Es ist immer so interessant bei Dir zu lernen wie alle Pflanzen auch deutsch heißen, besonderes "seidiger Hartriegel" finde ich so exotisch-hoerend! :) Das Baby kommt ja bald in die Welt, oder? I admit I'm quite pleased with my drawing. It's not bad for someone who can't draw! I did enjoy doing it as well and never would have done it without inspiration from you. I wish you were coming to SF, too! Maybe if I make it to TN one day (and there's lots of reasons to!) we can meet then. I love how plants remind me of the person from whom I got them! Ich liebe Eichhörnchen! Es gibt eine kleine Chance (haengt an meiner Mutter ab) dass ich mich diesem Herbst in Hamburg finden koennte! There are different species of Jacks; I know they are winter hardy to zone 3, but I don't know if they need cold to grow. Gail (in Nashville) mentioned them growing in TN, but not sure about southern AL. Thank you for appreciating my art. Clearly, you are a connoisseur. The squirrel looking more fun than angry in the larger shot I reduced. (I get along with squirrels just fine.) Looking forward to SF!!! Nandina is coming inside, along with the Pineys, for the foreseeable winters. (I just lost something else that was mulched and zone 6, so...). I've heard a lot of great thins about Asheville. I'm sure you went to Biltmore? Wow, a real artist likes my drawing! :) I do like how I'm reminded of friends through my garden plants! You certainly are mishing and mashing a lot lately. You got a PPPP? Grrrrrrr, green now! Fiona is georgous, I hope you have done better with her, nickname wise. Gaaaaaaa, a redhot poker, liking the amsonia much better. It's great how we garden bloggers have formed a very friendly and informal community, isn't it? Have fun at the Spring Fling! See, I can do mish-mash too in a comment. Monica: Yes gardeners do make the best blogging friends! In fact that is how I met YOU! ~YOUR home town~..the city of roses..oh gosh I forget the name....and then you saw that post where I showed and told and that's how we became blogger friends!! Don't you think this is a small world?!! How nice is that ..mailing plants..they would NOT get past Canada customs if mailed here! Mish Mash Monday is a great idea!! I'm so jealous that you got red hot pokers! I have tried to grow them twice and both times they have failed to come back. That yellow iris is awesome. Hi Monica - great post and covering so many things too! Hope you had a good time in Chicago and the teas arrives safe and sound! Great Mish-Mash Memorial post, Monica ... lots of good stuff going on ... Jack in the pulpit, a favorite. Thought of you at SF over the weekend ~ I'm sure you have many wonderful memories.